What is a Small Cap Stock? A small cap stock is a stock of a publicly traded company whose market capitalizationMarket CapitalizationMarket Capitalization (Market Cap) is the most recent market value of a company’s outstanding shares. Market Cap is equal to the current share price multiplied by the number of shares outstanding. The investing community often uses the market capitalization value to rank companies ranges from $300 million to approximately $2 billion. The word “cap” in this term refers to a company’s market capitalization. The classification between small, mid, and large-cap companies is subjective and can vary among brokeragesTypes of Markets - Dealers, Brokers, ExchangesMarkets include brokers, dealers, and exchange markets. Each market operates under different trading mechanisms, which affect liquidity and control. The different types of markets allow for different trading characteristics, outlined in this guide and market analysts. Market capitalization is determined by the number of shares outstandingWeighted Average Shares OutstandingWeighted average shares outstanding refers to the number of shares of a company calculated after adjusting for changes in the share capital over a reporting period. The number of weighted average shares outstanding is used in calculating metrics such as Earnings per Share (EPS) on a company's financial statements of a company, multiplied by the current share price. It is worth distinguishing between small cap stocks and penny stocks. Most small cap stocks are penny stocks. The share price of small cap stocks can easily go above $5 each ($5 is the cut-off for penny stocks as determined by the SEC). In addition, small cap stocks demonstrate higher liquidity relative to penny stocks. Every investor can easily add some small cap stocks to his/her portfolio. However, as with any other type of investments, there are pros and cons of investing in small cap stocks. Relative to bigger companies, small cap companies show a significantly higher growth potential. Most small cap companies enjoy a larger room for future growth compared to large-cap companies, making them attractive options for investors. 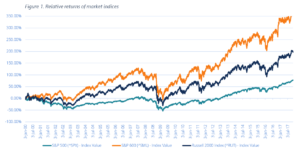 From Figure 1 below, the relative returns of small cap indices such as S&P600 and Russell 2000 significantly outperform the S&P500 index returns. For small cap companies, it is easier to grow significantly their operational and financial base than is the case for most large-cap stocks. Therefore, picking the right small cap stock can turn into a profitable investment. Information about the small cap stocks is harder to find compared to large and mid-cap companies. Analysts typically give little attention to these companies; thus, there is a high probability of improper pricing of small cap stocks. This situation creates vast opportunities for investors to leverage the inefficiencies in market pricing and earn a great return on their investments. Financial institutions, including mutual and hedge funds, should comply with certain regulations that do not allow them to invest heavily in small cap stocks. For this reason, it is unlikely that the stock price will be artificially pushed up because of large investments from major financial institution. Investing in small cap stocks involves higher risk. First, small cap companies may have an unreliable and faulty business model. In this case, if the company’s management is not able to adjust the business model, it will result in poor operational and financial results. Besides that, the small cap companies usually have less access to new capital and new sources of financing. Due to this reason, it is more likely that the company will not be able to bridge gaps in its cash flows or expand the business because of inability to undertake the necessary investments. Small cap stocks are less liquid than their large counterparts. Low liquidity results in the potential unavailability of the stock at a good price to purchase or it may be difficult to sell the stocks at a favorable price. Low liquidity also adds to the overall risk of the stock. Investing in small cap stocks can be a time-consuming activity. Due to the under-coverage of small cap stocks by financial institutions and analysts, the amount of available research on small cap companies is usually limited. An investor who is willing to invest in small cap stocks should spend a substantial amount of time on the researching a company to determine whether the investment is reasonable. Small cap stocks should not be viewed as fraudulent and low-quality investments. On the contrary, small cap stocks may provide investors with an opportunity to earn a substantial return on their investments. However, this type of investing should be approached with caution as small cap stocks are often risky and volatile.